A Crumbling Capitalist Schooling System? What follows is a synopsis of John’s lecture with my reflections integrated into it. For the last 3 decades schooling has been thought of as preparation for the real world. 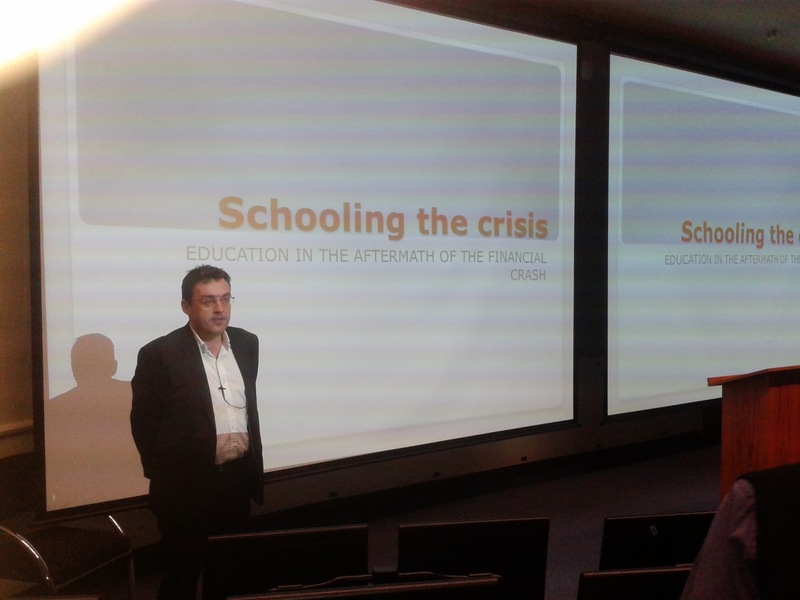 So far, the post financial crisis of the last 5 years has not made people question what needs to change in schooling. Yet we need to acknowledge that we are preparing students for uncertain futures. History has shown us that economic, cultural and social change go hand in hand. If the current crisis is seen as a political crisis nothing will change in education. An examination of the economic situation of the last 5 years shows a possible shift in how the world will operate in the future. Once we view this as a new economic normal (rather than being able to return to previous normal) schooling must be affected and changed. Now a new crisis means we need education reform again. Calls for Radical change intensified: We need to move on from industrial age method to learning how to learn. Connect to real life and the community. Schools need to change quickly so do notions of intelligence. Enable by new technology. Hyper school improvement. Whole systems change and scaled up based on evidence. Reform based on deliverology. Teachers were holding us back! These reforms will change that. Renewed concern about inequality and social justice. This trend not as highlighted as the previous 3. In the last 30 years, NZ has gone from one of most equal to most unequal societies. This renewed concern with fairness can be seen in the popularity of ‘The Spirit Level‘. Longer term: Manifesto for Mean times! 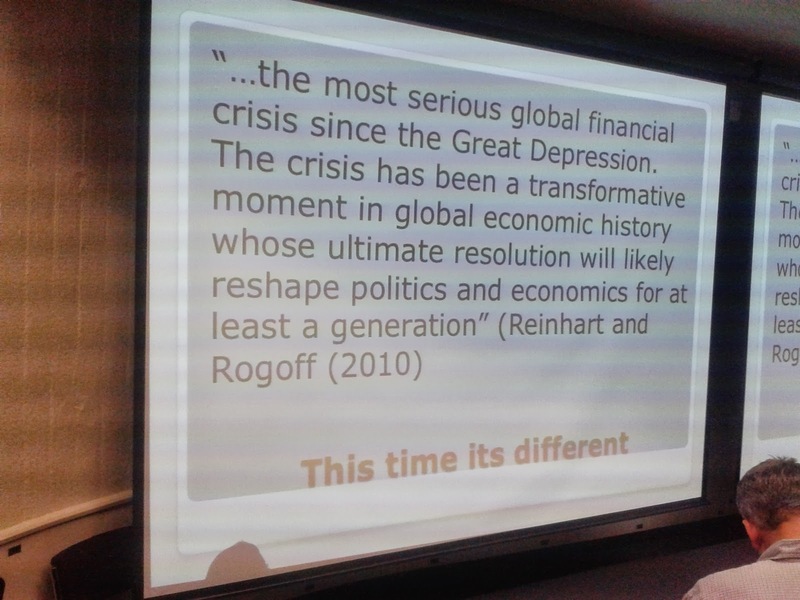 2008 started as an economic crisis became a political crisis, and is now becoming a social crisis e.g. Portugal, Greece. The future is hard to predict but austerity and reduced consumption could well become the new norm. This may lead to a far more diversified economy in the future. A revamped high tech economy at the top but with fewer people involved because of less people having enough income. Secondly, there will be less money in the middle. And a 3rd ‘Survival sector’ – with people going back to the land growing food, making crafts etc. This will involve semi-formal part-time work and part time growing food. If this is the case, a recalibration of schooling will be required. Positional advantage competition will be intensified. A crisis of legitimacy will arise as costs and rewards do not balance out. This will result in crumbling capitalist schooling as capitalism no longer delivers on promises it makes to students.There will not be prizes for all like we promise at the current time. A gradual slowing of schooling may occur – which may lead to not being tied to learning objectives. More informal time will come into school (such as that already seen with schools taking on Google’s 20% time or Albany Senior High School’s Impact Projects). This means more fun and more connections with communities. The emergence of this will be slow, competitive and intense. While not considering himself an “education futurologist” John provided a challenging and well reasoned prediction of what may occur in the near future. This climate provides obvious challenges (practically and philosophically) but there are opportunities there as well for people to plan ahead on how to best meet these challenges. Because one thing is for sure, education does need to adapt to this uncertain future and I for one will not be clinging to the way that I have always operated. The idea of alternative educational spaces resonated with me and is one of the main ideas I look forward to exploring further after this lecture and as I begin my journey at Hobsonville Point Secondary School next term. This entry was posted in Uncategorized and tagged capitalism, community, economy, education, future, ideas, learning, reflection, schooling by stevemouldey. Bookmark the permalink.